If you are reading the title of my recipe and thinking to yourself “Is this Nutmeg Nanny? Did I click on the wrong blog” I completely understand. I have been posting A LOT of green foods lately. I’m not sure what is wrong with me. I’m hoping to get out of that rut soon However, I have also decided to participate in a CSA this summer. So that means lots and lots of fresh vegetables that need to be prepared each and every week. 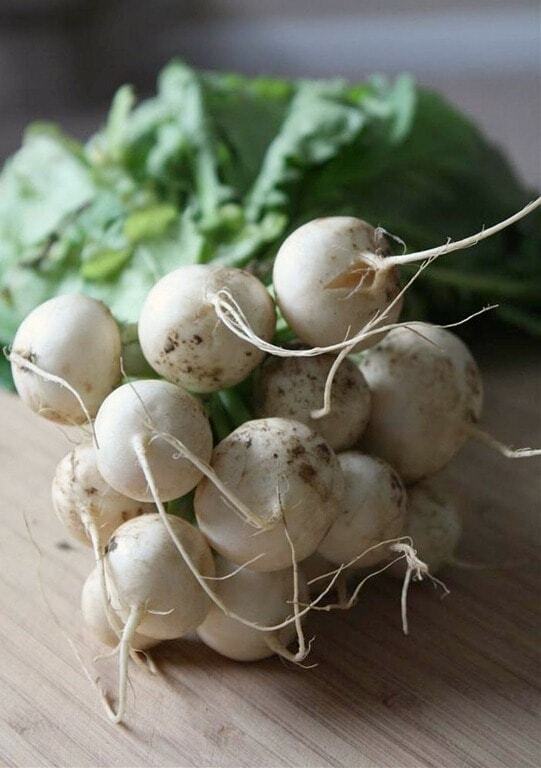 Last week I was given Japanese turnips and komatsuna. Two things I have never cooked with in my life. I called the farm and was told they both could be eaten raw or gently sautéed. I went the sautéed route and decided to throw them together. I found the turnips to have a slight cabbage heart taste, (the cabbage heart is the light part in the middle of the head of cabbage. Most people do not eat this part, I personally really like it) which is a bit peppery. However, the pepperiness mellows out after the sautéing. 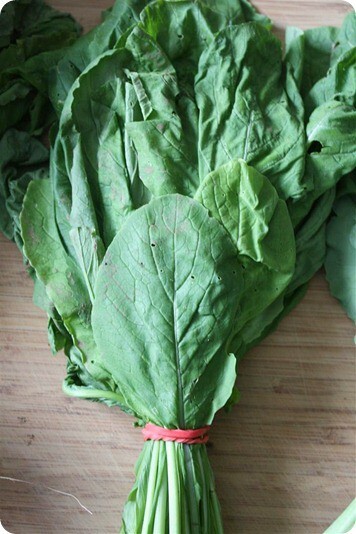 The komatsuna has a slightly bitter taste and has the texture of spinach. They seemed to pair quite lovely together. I know we enjoyed it….we ate the whole pan! In a large sauté pan, over medium heat, heat a few drizzles of olive oil. Once hot, cook onion until they start to soften. 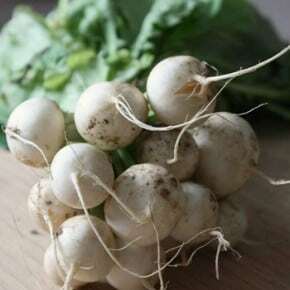 Add turnips and cook until slightly brown and soft. Approximately 5-7 minutes. Once turnips reach desired doneness throw in komatsuna and sauté for about 2 minutes. Once the komatsuna is softened, flavor with salt and pepper, take of the heat and enjoy. I’ve never had either! But I always enjoy trying new vegetables and fruits. A saute seems like a safe way to go. The result looks very yummy. I’ve never had either of these, but the end result looks like a lovely side dish! I love that you kept the recipe simple so the veg itself could shine! 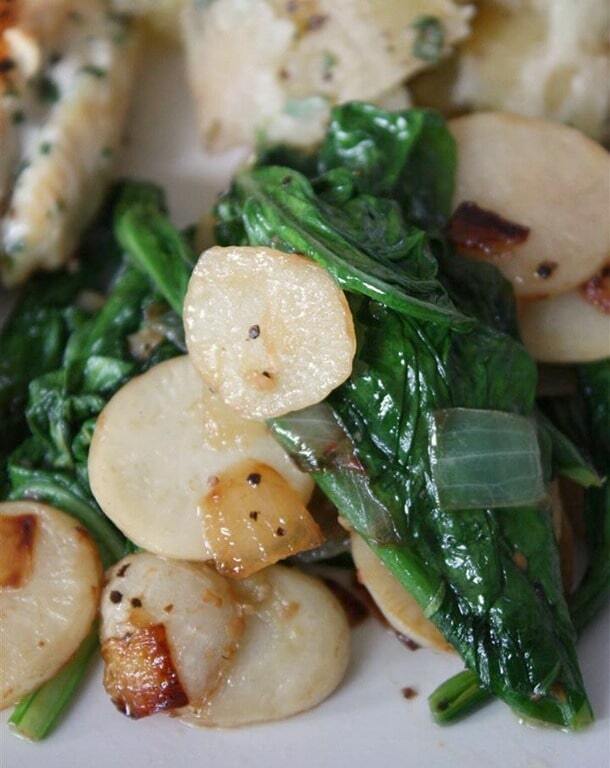 I love the picture–the turnips remind me of sliced water chestnuts. I love how joining a CSA really forces you out of your green comfort zone! I’ve never heard of either of these, but should I get them in my CSA I’ll know how to prepare them! We got komastuna & tatsoi with our CSA a few weeks ago. If you get either in another week, I HIGHLY suggest a nice asian noodle soup with chicken & shiitakes. We put the komastuna in the soup for about 3 minutes. The tatsoi is so tender we just dropped it in a bowl, put on a little squirt of sriracha and ladled the soup on top. We’re actually craving komastuna & tatsoi over here! I love recipes with ingredients that I don’t yet know :-). I will have to look those up. Thanks for sharing! Gorgeous! My sister lives in NY and I was thinking about getting her a CSA membership as a gift. Such beautiful bounty! I’m mostly a baker myself but you wouldn’t know with the number of non baking post I’ve done most recently! 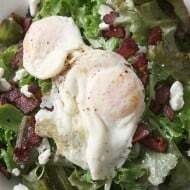 I love fresh vegetables – and your dish looks yummy! Yum! Next year I definitely want to join a CSA… I keep seeing everyone else’s yummy veggies and getting jealous! I’ve never had either of these but this looks delicious! I should be more adventurous in my fresh produce eating! I just love my CSA! I hope to get turnips this week. Gorgeous dish! first time here..lovely space you have..yummy recipe collection..
Green is good! 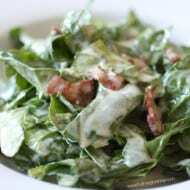 The beauty of being part of a CSA is all new vegetables that you are going to discover, and learn to prepare. Awesome. I’ve never had either of these veggies — that’s the brilliance of a CSA! I wish I could find one just a little bit closer to my house because I’d be all over that! Brandy, I have to tell you I was a bit shocked to see all those veggies. You go girl, sounds like that CSA box will be life changing. These veggies look fabulous!